Justice Elena Kagan presided over the finals of the 2012 Van Vleck Constitutional Law Moot Court Competition. 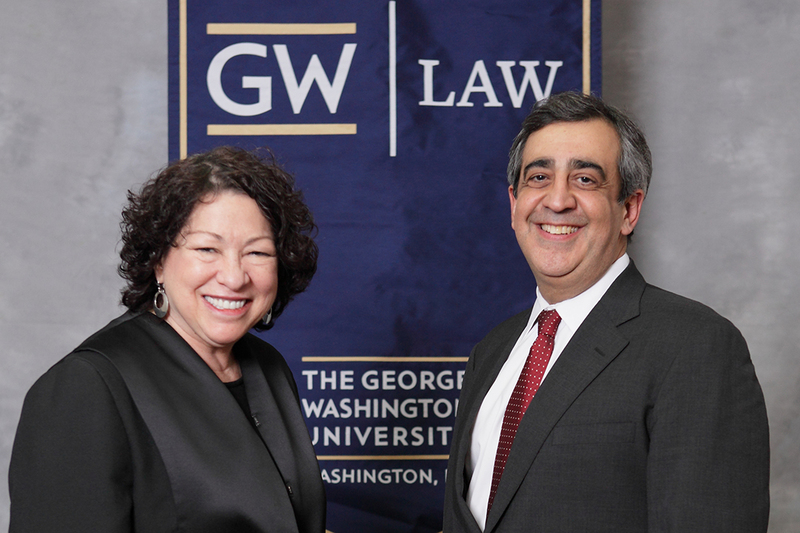 Justice Sonia Sotomayor, who presided over the finals of the 2014 Van Vleck Constitutional Law Moot Court Competition, with Dean David Johnson. Dean David Johnson is primarily responsible for oversight of advocacy competitions at GW Law, be they alternative dispute resolution (ADR, such as arbitration), mock trial (trial practice) or moot court (appellate practice). If you have a question regarding any of them, please contact Dean Johnson. If you are a GW Law student, competitions provide valuable opportunities to hone your advocacy skills and earn membership on one of our three Skills Boards: Alternative Dispute Resolution, Mock Trial, or the Moot Court. The George Washington University Law School hosts several interscholastic competitions that are open to all ABA-approved law schools.